Artists do not often have a forum through which they are able to speak their thoughts and ideas on the state of the arts, past, present and foreseeable future,a place for ideas, tributes,interviews,reviews, critiques and updates. A place where other Artistes can visit, where true icons of the arts and burgeoning new talent can be recognized and remembered. Malfinis Productions tries to make this possible in our small way by providing this page, "The Beacon",where quite apart from our blog page we will be featuring postings of tributes,interviews,reviews and critiques by and about accomplished writers,artists,artistes,cultural icons, dancers , dramatists and productions while we keep you up to date with our progress. 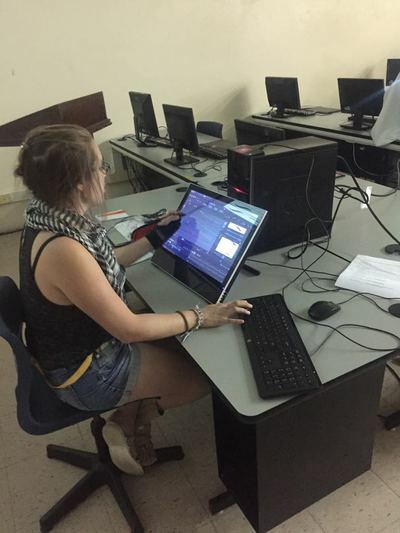 Toon Boom Facilitates First 2D Animation Boot Camp in St.Lucia! ToonBoom along with Malfinis Film and Animation Studios Inc has embarked upon presenting St.Lucia's first 2D animation Boot Camp. Toonboom's representative and professional animator Marie-Ève Lacelle brought a relaxed and exciting approach to the event, ensuring that the very devoted participants were kept indulged throughout the five day learning process. 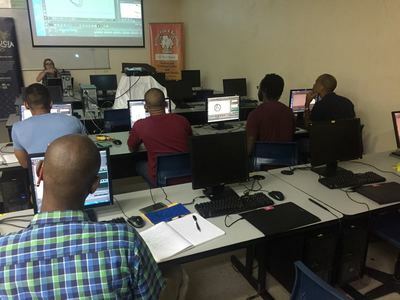 Animators from six OECS countries namely Antigua, Grenada, St. Vincent, Dominica, St. Kitts and Nevis and Saint Lucia participated in this highly interactive training, where new talents were honed, new links and networks established. This initiative was made possible by the collaborative efforts of the Saint Lucia Coalition of Services Industries (SLCSI), Caribbean Export Development Agency (CEDA) and Export Saint Lucia. Malfinis Film and Animation Studios Inc. an authorized training Center for ToonBoom, provided invaluable technical support. 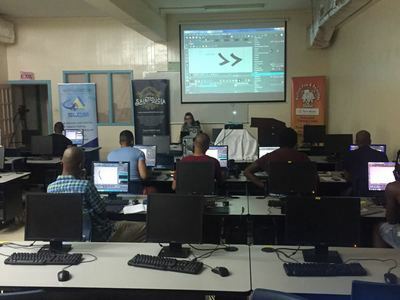 ​The Lab facility at the Sir Arthur Lewis Community College (SALCC) provided the ideal venue and environment for such a boot camp; prerequisites to unleash the creative talents needed for their animation skills. The event commenced on Monday, 13th August 2018 and ended Friday, 17th August 2018. The facilitators of the Boot-camp aspire that the event would act as an impetus for more collaboration between themselves and the participants, as well as improve the quality and efficiency of Animation in St.Lucia and The Caribbean region. 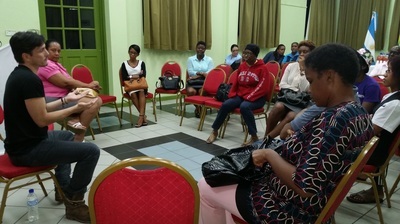 AVFA Hosts free film viewing to its members of the Trinidadian film "Green Days by The River"
The AVFA's first initiative for 2018 was to treat its members to a free screening of the Trinidadian film Green Days by the River. A few of us who attended held a very animated and insightful discussion following the screening at Rituals Coffee diner next door where both the content of the film as well as its technical quality was analysed. 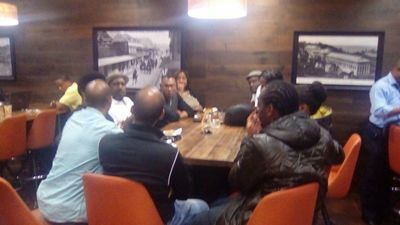 Thank you members and the Caribbean Youth Film Festival for coming and contributing to this effort. I believe the initiative was enjoyed by all. We will certainly try to repeat such an activity in the not too distant future. ​Animation, a colorful and fast rising media art form with vast reaches globally…from cartoons like Avatar, Teen Titans GO , The Boondocks and animated digital visual FX films like Batman versus Superman just to name a few, it’s no surprise that Animation is a globally accepted medium and a billion dollar industry. Studios from around the world are popping up to take the wild animation ride. 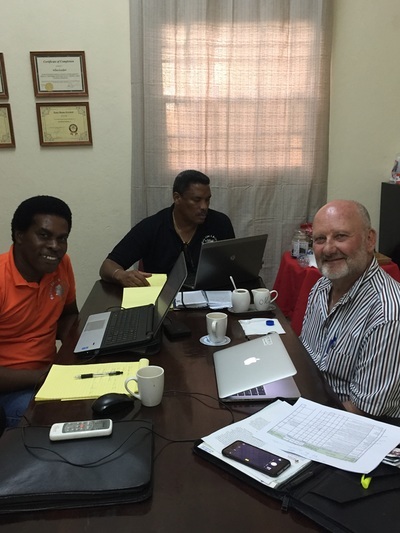 The Grenada Ministry of ICT is one of those entities within the OECS making a positive impact on the development of the Industry in the Caribbean Region. The Ministry of ICT through the CARCIP contracted Malfinis Film and Animation Studio Inc, the Authorized Training Center for Toonboom Animation in the region and one of the first Authorized Certiport Testing Centres for Toonboom Animation Software globally to deliver the training. The 2 D Animation Training Solution is structured to deal with the realities of small island states with limited economies but unlimited creative talent. 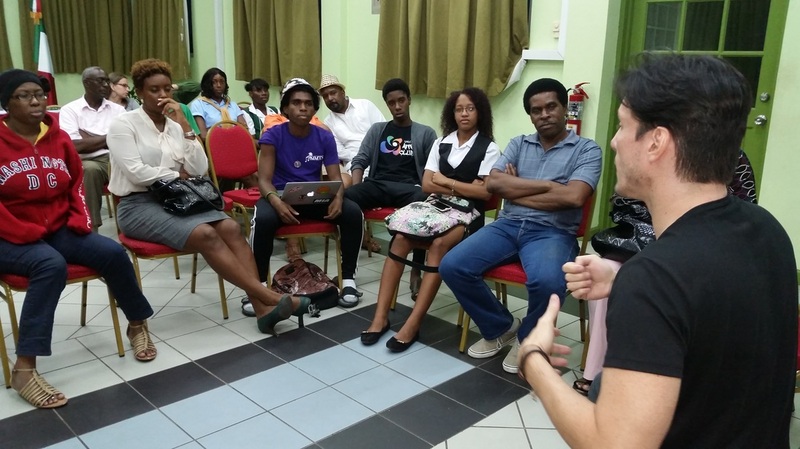 Through the Ministry of ICT, 25 young artists were trained in Grenada during the latter half of 2016 up to April 2017. The Ministry of ICT through the CARCIP Project provided the training space, equipment and software needed to facilitate Malfinis’ six (6) month training solution in Toonboom Harmony and Story Board Pro. Twenty-five (25) students in all were trained and now have acquired the knowledge of a new and “in demand” creative skill . While some students look to further their career in animation in their own time, and at their desired pace having completed the training, seven (7) of those trainees went on to pursue their Toonboom certification,earning them industry recognition as animators globally, they also became the FIRST EVER trainees globally to benefit from the Certiport Certification process. Certiport is a Globally recognised Certification Platform and is now fully responsible for executing certification tests and awarding professional certification to successful applicants on behalf of Toonboom Animation Inc. Certiport operates via their global network of Authorised Testing Centers. 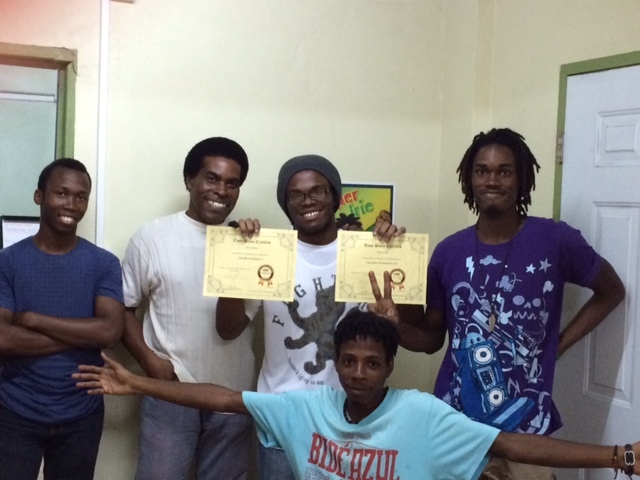 Certiport Proctor, Malfinis’s Studio Manager and Senior Trainer Tevin Loctar had high praise for the seven certified Grenadian Animators and Commented that these 7 young artists were focused and serious about creating a career for themselves in animation and he looks forward to great things from them in the future. Interested individuals are invited to call the CARCIP office at 440-7011 to register to do an aptitude test to be selected as part of the second cohort of trainees starting in June 2017. We can be sure that this is just the beginning, there are much greater things that await the Caribbean’s growing interest and immersion into the global animation creative melting pot …and without a doubt Grenada Ministry of ICT ,the Grenadian animators and Malfinis Film and Animation Studio Inc will be there every step of the way. ​ MALFINIS broadens its involvement in Animation Training in the OECS. 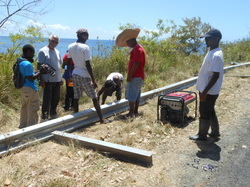 The overall cost of the first phase is 25 million US Dollars and of which 3.0 M USD is a grant.. The funding allocation for such a project is as follows a) Grenada credit is in the amount 6.5 SDR equivalent to 10 MUSD. B) St Lucia and St Vincent and the Grenadines each 3.9 SDR equivalent to 6’0 MUSD. The regional grant is equivalent to 3.0 MUSD targeted at the Caribbean Telecommunication s Union project This is an IDA credit with a final maturity of forty (40) years and a grace period of 10 years. The countries can anticipate a ten year grace period. The CARCIP project is structured in three primary components viz a) Regional Connectivity infrastructure ; b) an ICT Led Innovation and c) an Implementation support. A fourth component is already scheduled but can only be expected post Phase 1 of the project. The fourth component will be aimed at improving Government and private sector efficiency and transparency by leveraging the regional broadband infrastructure towards delivery of a wide variety of e-services..
Malfinis Film and Animation Studio, is expected to be in Grenada for the next five months conducting training for CARCIP and the Grenadian government at the newly retrofitted lab at the T A Marryshow Community College. Of animation. 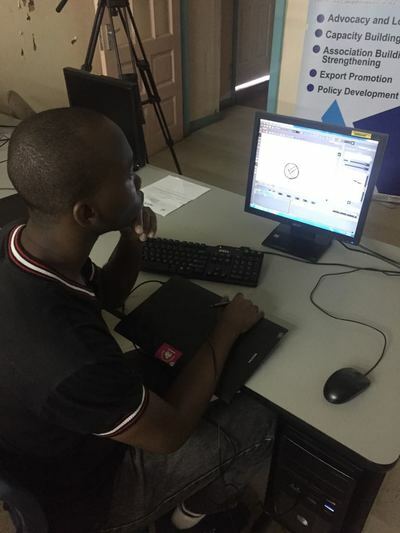 In accordance with the outline of the CARCIP project, the training in animation is just a small component of the overall project within the ICT Led Innovation. Following the five- month programme which is characterized as of continuous assessment , the participants are expected to undertake an examination to fulfill the requirements of Toonboonprofessional certification which represents a hallmark of the global standards and benchmark of the Animation industry. The students on successful completion, are expected to be prepared for the global network of the players in the industry and will get the opportunity to present themselves for consideration for internships and employment at production studios. Course which is free to the participants who she said had to undergo an aptitude selection process. However, she also encouraged the commitment which they ought to make in order to derive true value and reward from the opportunity offered to them. Mr. Milton Branford of Malfinis Film and Animation Studio, outlined in his introduction the scope of career possibilities that exist in the industry for the participants. He provided an outline of the animation training program, schedules and expectations, and the process and value of certification – which was also reinforced by T A Marryshow Community College and the Centre for Excellence. Malfinis has a contingent in Grenada which comprises of its senior animators - Tevin Loctar and Francis Butcher. Butcher who is the facilitator of the training for the five months is a Toon Boom certified animator. The team Malfinis, was accompanied by David Jordan of Giordano Associates Ltd Giordano Associates has offered and enabled the business development and advice to this initiative. 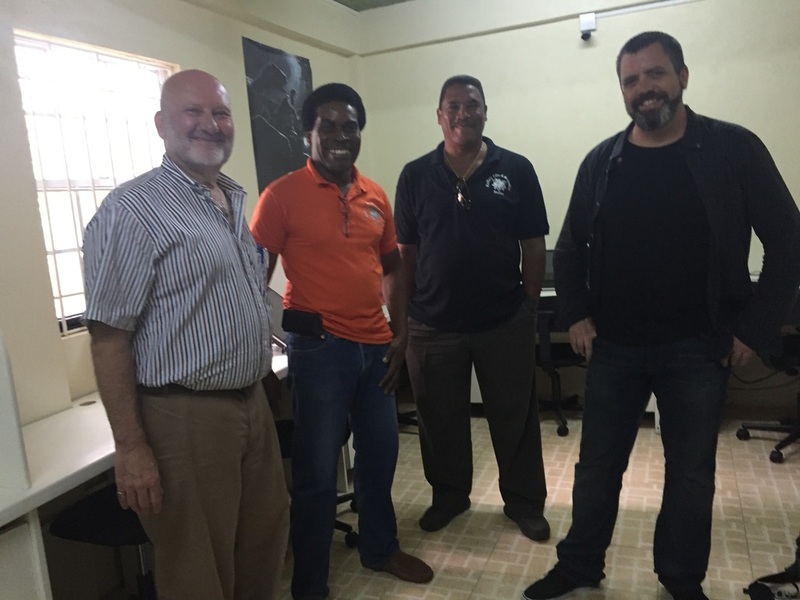 Two well renowned Animation industry consultants sharing more than sixty years of experience in the Animation industry – Steven Koltai and Richard Smitheman both of the USA – visited the Malfinis Film and Animation Studio on Friday 1st April 2016. “ The main purpose of the visit by the global Experts in the Industry is to conduct an institutional gap analysis as a precursor to developing recommendations and appropriate training to address what is needed to prepare Malfinis Film and Animation Studio with what is required to conduct the business of animation globally. During the visit they met the officials of Caribbean Regional Communications Infrastructure Programme ( CARCIP) as well as the contingent of local trainees participating in a 2D Animation training programme conducted by Malfinis Film and Animation Studio Inc. at the local National IT Centre in Castries . Malfinis Theatre Film and Animation Studio Inc. attended the second Kingstoon Festival in Jamaica March 12th and 13th Milton Branford , Managing Director of Malfinis Productions Theatre Film and Animation Studio Inc. together with Senior Animator – Francis Butcher and Business Development Advisor -David Jordan were the representatives of the company. 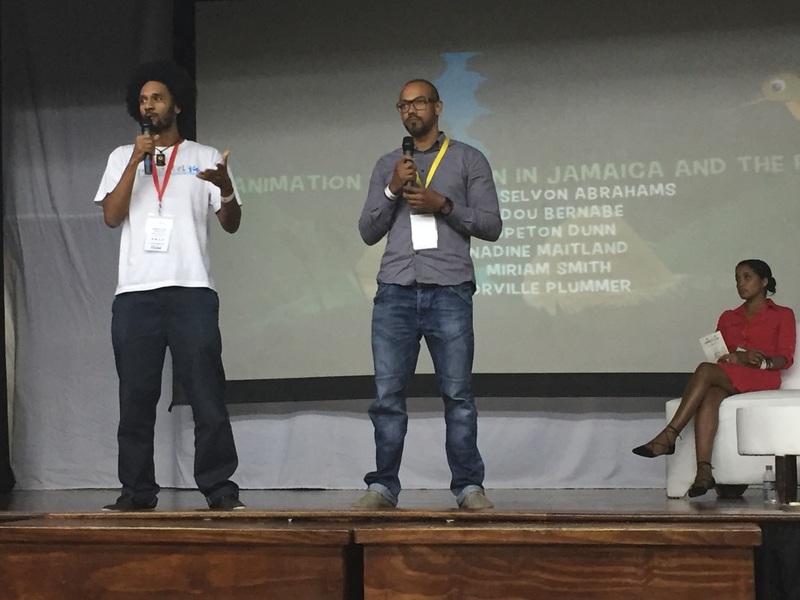 Milton Branford says “ this provided an opportunity to witness first hand the standard of the animation industry In Jamaica and the attempt to broaden the scope and development in the rest of the Caribbean. 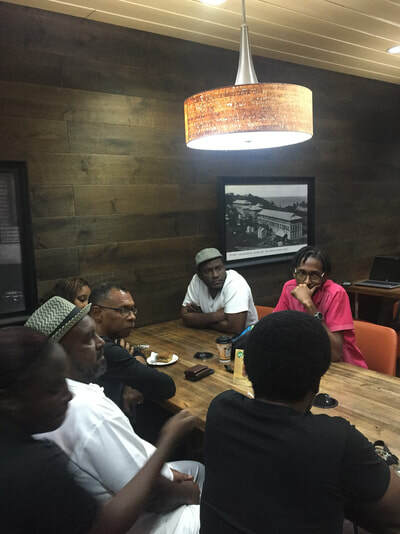 As an OECS territory participant, he recognizes what the exposure can provide for his own studio and its potential for growth and the networking opportunities to learn from the several international experts and resource persons slated to attend. 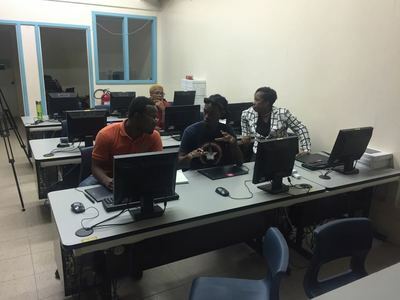 Branford envisages that this opportunity can further generate a platform for a networking base for his training centre and a reservoir of assistance to enable further development of the animation industry in the OECS region. He says he expects to learn from the talent, creativity and innovation of the Jamaican animation industry. Branford expresses his gratitude to the World Bank and the Caribbean Development Bank , as well as the Jamaican Government to sponsor and enable his company’s delegation to participate in “KingstOOn 2016 which he says “ is an important mechanism which can stimulate interest and build the required capacity necessary for the emerging animation sector in the region” Branford says Malfinis studio which has a licence as an Authorised and Accredited TOONBOON Training Centre and Production Studio, expects that KingsTOOn will also provide participants with the perspective of a platform to showcase their creativity and innovation in addition to increasing awareness of employment opportunities in the animation industry. The exposure that was provided "can help address high levels of male and female unemployment (especially in the youth demographic), and contribute to the identified need to diversify our regional economies,” – a Jamaican government Ministerial official has said. The organisers of Kingstoon 2016, indicated that over nine hundred (900) entries from ninety three (93) countries were received for the KingstOOn Emerging Animators Content Competition (KEACC) and the KingstOOn International Animation Film Festival (KIACC). However a shortlist of forty-four ( 44 ), was selected from among the ninety-five (95 )entries received for the KEACC. The aim of the KEACC is to unearth new talent and showcase the excellence of the content created by the Caribbean’s animation practitioners. The entries were submitted in categories of storyboard, character design, Caribbean short film and concept. Some eight hundred and forty (840) submissions for the KIAFF came from just about everywhere in the world – Africa, Asia, the Caribbean, Europe, North, South and Central America, the Middle East, and Oceania. These were shortlisted to 49 films which competed for awards in the categories of student film, short film and full feature film. In the Caribbean, submissions were received from Antigua and Barbuda, Barbados, Cuba Guadeloupe, Haiti, Jamaica, Martinique, Saint Kitts and Nevis, Trinidad and Tobago. “The films from around the world were screened at venues around Kingston during the week leading up to KingstOOn, giving anyone interested in animated films a unique opportunity to view the work of artists from around the globe . 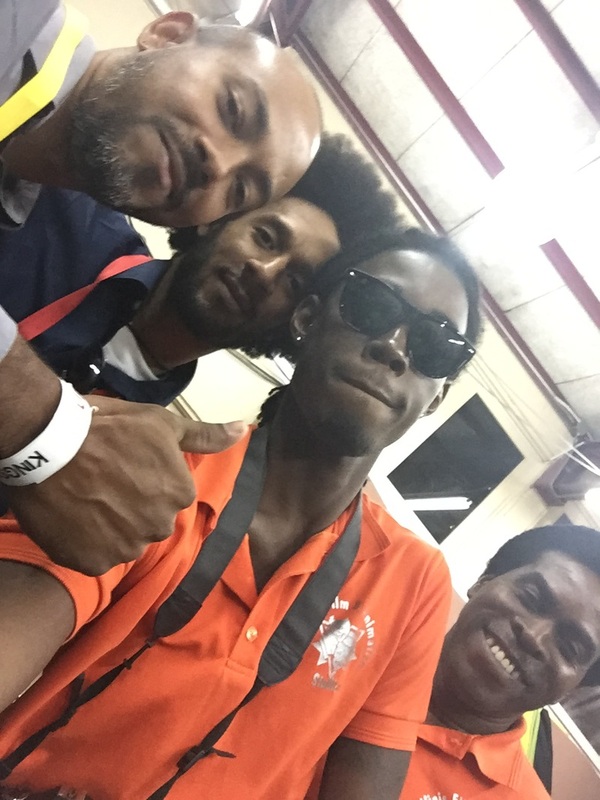 The KingstOOn Animation Conference and Film Festival took place March 12 and 13 at the Edna Manley College of the Visual and Performing Arts in Kingston, Jamaica. The KingstOOn programme, designed around the themes of Learn, Earn and Display, comprised of an animation conference, a marketplace to link content producers with buyers, in addition to the competition and film festival. KingstOOn is an initiative of the government of Jamaica in collaboration with the World Bank and the Caribbean Development Bank. Negotiators for governments of all nations of the world are meeting in Paris this December. They will decide if global temperature should continue to rise, and by how many degrees. Some nations are willing to let the meter go up by 2•C or more above pre-industrial levels. Such a rise would be disastrous for the Caribbean and other Small Island Developing States. With a 2•C increase, by the end of this century 1300 sq. kilometer of land will disappear in the Caribbean: an area comparable to the whole of Barbados, Saint-Vincent and the Grenadines, Anguilla, Antigua & Barbuda, combined! For a fair chance to stay alive, we want the world to agree on a 1.5•C max rise . 1.5C or below means holding the escalating increase in global temperatures to less than 1.5 degrees Celsius above average pre-industrial levels. It also means strengthening the currently agreed international goal of below 2 degrees that we now know threatens global prosperity and even the existence of nations. Science and evidence calls for keeping warming to a minimum to help communities survive and thrive, leaving 1.5C as the only sensible choice for the international community. The 1.5C goal represents the best chance to fulfill the objective of the 195 state party UN climate change convention (UNFCCC) to prevent dangerous interference with the climate system. 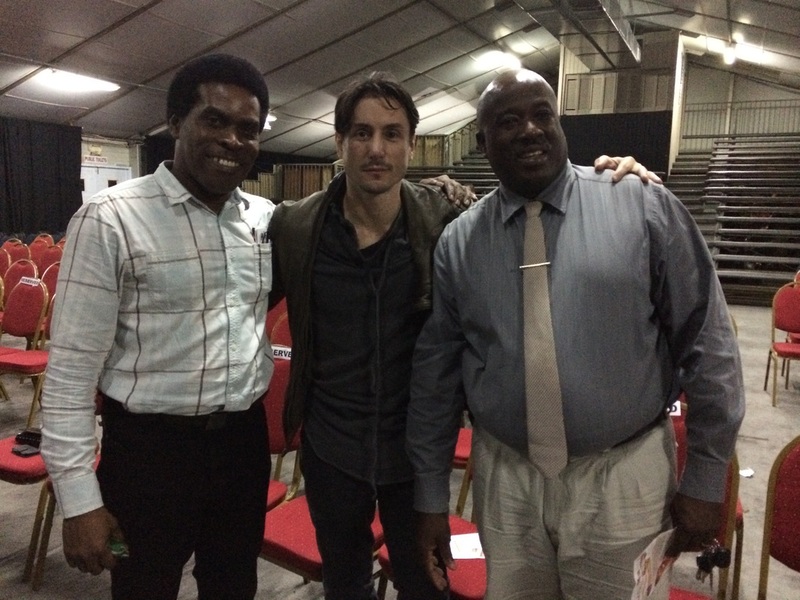 First Latin American and Caribbean Film Festival held in Saint Lucia and we were there. 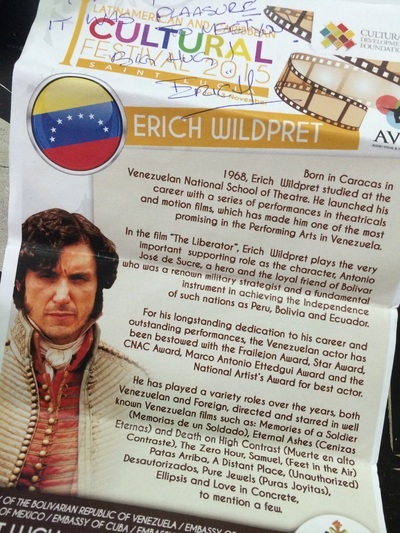 Malfinis's Managing Director Milton Branford recently had the great pleasure to meet and share with Erich Wildpret outstanding theatre and film actor who played a major supporting role in the film based on Simon Bolivar, called the "The Liberator",during the First Latin American film festival held in Saint Lucia. We look for ward to him returning to conduct a full actor's workshop some time soon. 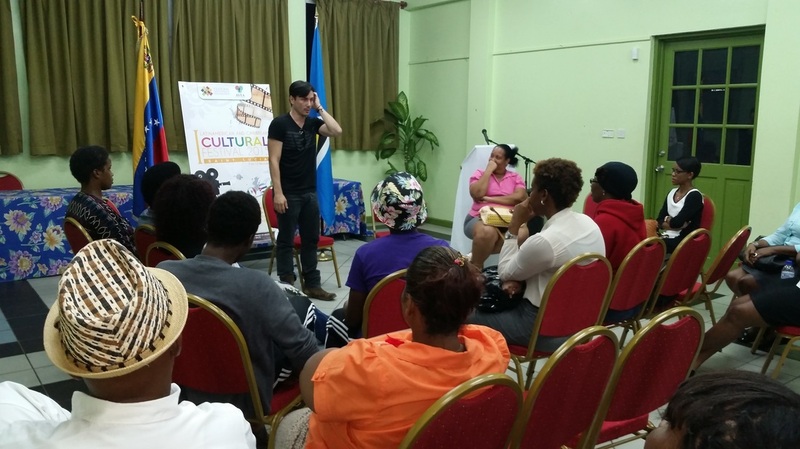 Erich's visit to Saint Lucia was part of the inaugural Latin American and Caribbean Film Festival staged in saint Lucia during the week of the 9th t0 13th November 2015. 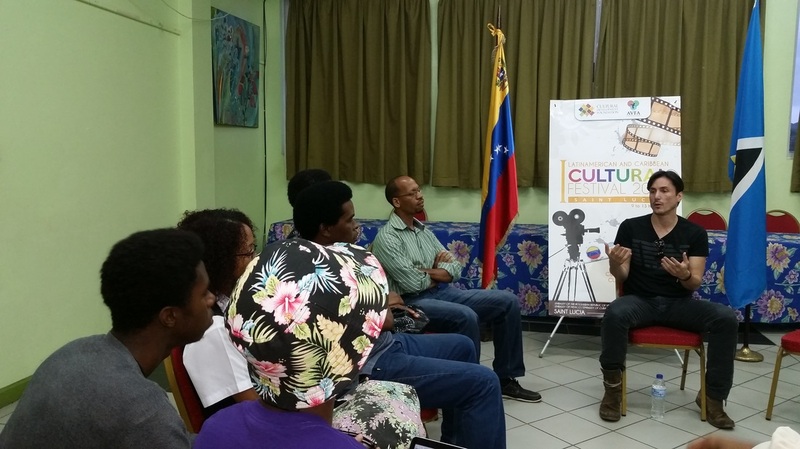 Presented by the latin american embassies of Venezuela,Cuba, Argentina,Mexico , and Brazil and supported by the Cultural Development Foundation and the Audio Visual and Film Association the festival also featured short films from aspiring Saint Lucian Filmmakers. The Latin American and Caribbean Film Festival is a first of its kind to be staged in Saint Lucia,and had a modest debut that put aside the pomp , ceremony, bells and whistles and placed Film at the core as a means to communicate and share cultural experiences between peoples of the Caribbean and Americas. This valiant collaborative effort by our Latin American friends promises to be a very powerful event capable of galvanizing the creative exchange of ideas,skills,and cultural experiences that can only lead to greater understanding and unification of peoples of the Americas and the Caribbean. We thoroughly enjoyed the showings, for those who were unable to attend you certainly missed a great experience, Hope planning starts soon for the 2016 festival , we can't wait. 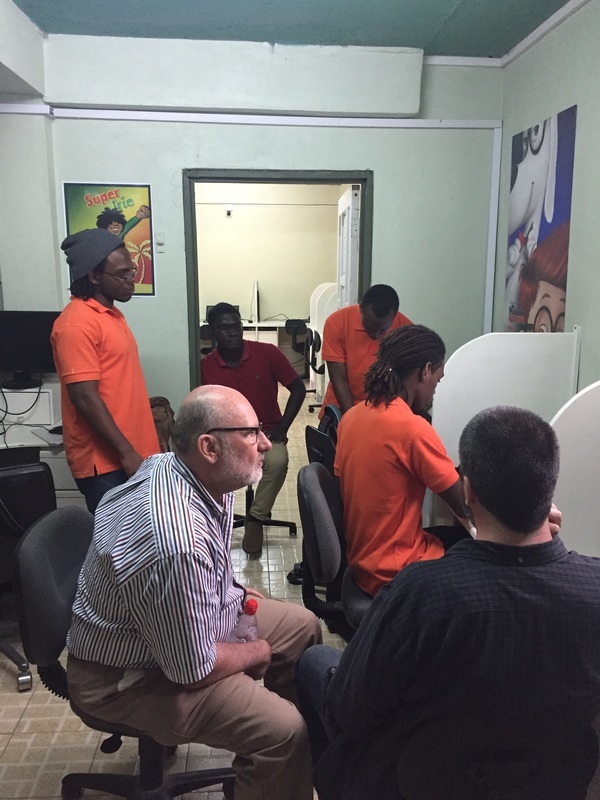 Malfinis Film and Animation Studio Inc. has been selected by the Caribbean Regional Communications Infrastructure Programme (CARCIP) to provide ICT training in the following : 2D Digital Animation Training and Certification. The training is crafted for a period of nine months total. This regime would consist of 4 months classroom training at the National ICT Center in Castries, followed by 4 months internship on the production pipeline at the MFAS Studio, this in turn is followed by two weeks of pre-certification review and a TOONBOOM certification exam. Applications are invited to register for this once in a lifetime opportunity for fully funded training for the unemployed artist provided by CARCIP and facilitated by Malfinis Film and Animation Studios Inc.
Training and certification is free to unemployed youth between the ages of 17 -35years. Eligible youth, must be holders of a minimum of three CXC's, have at least one year job experience in the course of interest .Applicants must also meet the specific requirements of the training course such as being able to score well on the mandatory aptitude test. Training will be conducted at the National ITC Center opposite the Derek Walcott Square in Castries with the internship being conducted at the Studio Location. The CARCIP ICT Skills Development Programme is currently being implemented by the Ministry of Public Service, Information & Broadcasting in collaboration with the TVET Unit, of the Ministry of Education, Human Resource Development and Labour. The programme is part of the Government's overall strategy to increase economic growth by enhancing productivity and technical expertise within the local ICT sector. Application kits as well as course information is available at our Office at #2 Calvary Road or on our website: www.malfinisproductions.com as well as the CARCIP website at www.carcip.govt.lc. Honourable Dr. James Fletcher, Minister with responsibility for Public Service, Information, Broadcasting, Sustainable Development, Energy, Science and Technology in the Government of Saint Lucia Speaks on the benefits of ICT ,Animation, and the Saint Lucian Government's commitment to facilitating the development of animation as a viable career option for young artists and entrepreneurs. Malfinis introduces animation to young Saint Lucian artists at the National ICT Fair. Malfinis had a successfull day of introducing over fifty young artists to animation using Toonboom software and YIYNOVA graphic tablet monitors. A bit of a reality jolt though as the organisers and us catered for 15-20 persons we thouht would attend the animation segment and over 50 showed up . So we are very pleased with the level of interest in animation training. 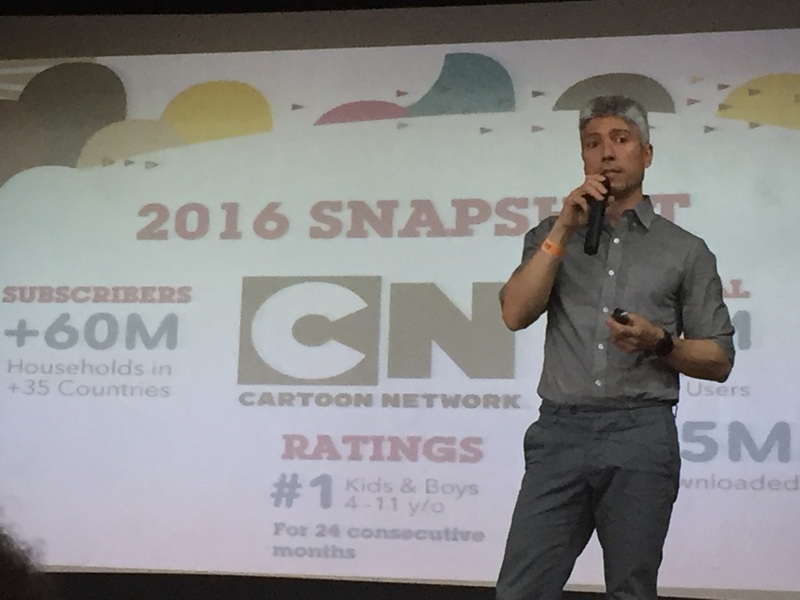 Toonboom was well represented and many took to the software quite easily and were impressed even more when we showed them some of the familiar cartoon shows that were produced using Toonboom software. CARCIP was pleased with the outcome, and thought that the level of interest showed clearly justifies a need for the provision of animation training, so we hope that we can get going on that soon as persons were asked to register for training with Carcip. MALFINIS facilitates video production workshop for UNICEF sponsored "one minute junior video project"
Coming straight off of attending the IADB facilitated Animation Cluster stakeholders meeting held in Jamaica 4th to 9th July, Malfinis Film and Animation studio was indeed very happy to have facilitated the UNICEF funded 5 day workshop on film for 20 plus at risk youth. The workshop was dubbed the "one minute junior video project" and the aim was to introduce the use of videography and film-making as an alternative career choice or creative means of self expression, storytelling and communication of ideas. The facilitators took the young attendees through the subjects of creative thinking , critical thinking,teamwork,the principles of writing and directing for film and the practical applications of filming and editing.The workshop was facilitated on behalf of the Division of Human Services MOH . The young people were all very talented and keenly interested , very focused and successfully produced 4 short videos at the end of the workshop, all with positive social messaging. Malfinis' Managing Director Milton Branford Jr. and Business developer David Jordan attended an IDB supported Caribbean Animation Cluster Meeting of the principal cluster partners in Jamaica on the 6th to the 9th of July 2015. 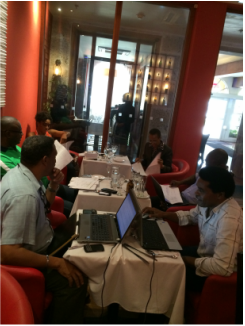 The meeting was primarily to streamline and strategize the project work-plan for training , marketing and structuring of the Cluster. The three primary cluster partners are Westoonz Animation Studio of Barbados, GSW Animation of Jamaica and Malfinis Film and Animation Studio of Saint Lucia. Tevin Loctar proudly receives his ToonBoom Certificates from Malfinis Film and Animation's Managing Director Mr Milton Branford Jr.. Tevin had been training with Malfinis and looked forward to the day when he became a certified animation artist.Tevin was all smiles when he was informed that he had passed the certification exam and had received his certification in ToonBoom Storyboard Pro 4.1 and ToonBoom Harmony 11. The team at Malfinis all joined to congratulate Tevin and celebrate his achievement. Great job Tevin, keep moving forward in the profession of your choice. 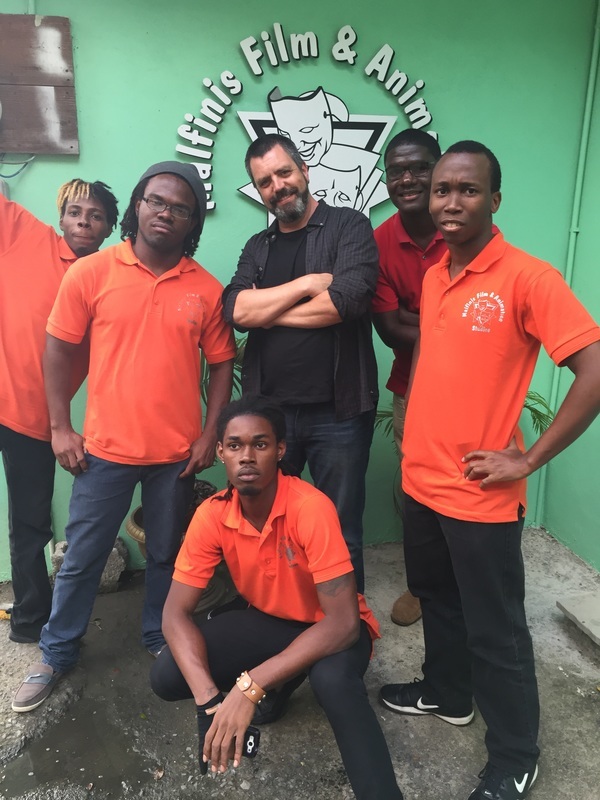 It was only a few ﻿months ago when the Malfinis team joined up with the John twins, “Kendal & Kernan” and planned to make history by creating the first ever Caribbean superhero comedy animation called "Super Irie". After much planning the team dove in head first to develop the initial draft designs for the title sequence, concepts for Episode 1. and began the grueling process of creating the characters, adding in the rigs for animation and establishing the background environment etc. with passion, determination, and a commitment to quality execution. In-keeping with the studios continuing innovative thinking, a decision was made to explore the various approaches available to raise the much needed finance for this animation project. 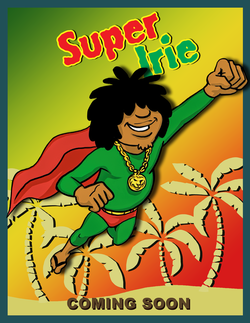 It was decided that crowdfunding was one of the seldom travelled paths of local concerns and so on January 18th 2015 the “SUPER IRIE” Animation comedy fundraising campaign was launched on INDIEGOGO, the global crowdfunding platform. 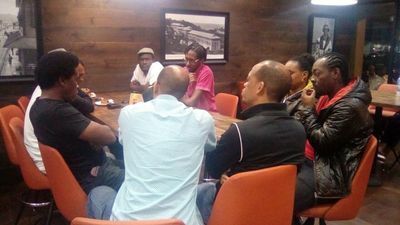 This was our first untested venture into the world of Crowd funding ventures and did not pick up the traction we thought it would, instead it did afford us the valuable exposure that created a huge awareness of our presence and the potential of the Super Irie project, creating an ever increasing number of followers and supporters who continue to encourage the Team to persevere and re-launch the effort again, so we are currently working on that and will inform everyone on the date for the re-launch. VP Sales for TOONBOOM Francois Lalonde and his lovely wife during a short visit to Saint Lucia enjoying a great local dinner, and good conversation with local Business Developer David Jordan and Managing Director for Malfinis, Milton Branford Jr.
Piton Film Festival Kicks Off !!! 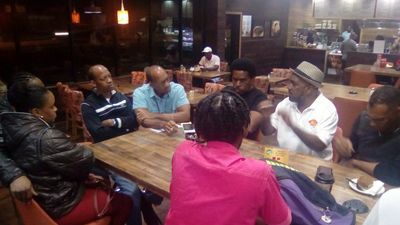 The winners of the inaugral Piton Film Festival were announced at The Blu Hotel on Saturday 8th Sept. 2014 during a rather intimate coming together of Saint Lucian film makers and producers. Malfinis Film and Animation Studio was indeed happy to be part of that intimate group and we have thrown our support wholeheartedly behind the efforts of the festival coordinators, Co-founder Emelyn Stuart, Chief Operations Officer at Stuart Films and Edmund A. Herman of SISTERS IN HARMONY and their team who have impressed me with their confidence in the potential of the local talent and their commitment to facilitating the growth and outward reach of those who wish to expand their craft beyond the mundane, and beyond the shores and limitations of Saint Lucia. MFAS joins the AFVA in extending Congratulations to the following inaugural Piton Film Festival Winners. Malfinis Film and Animation studio takes another bold innovative step forward with their latest collaboration. 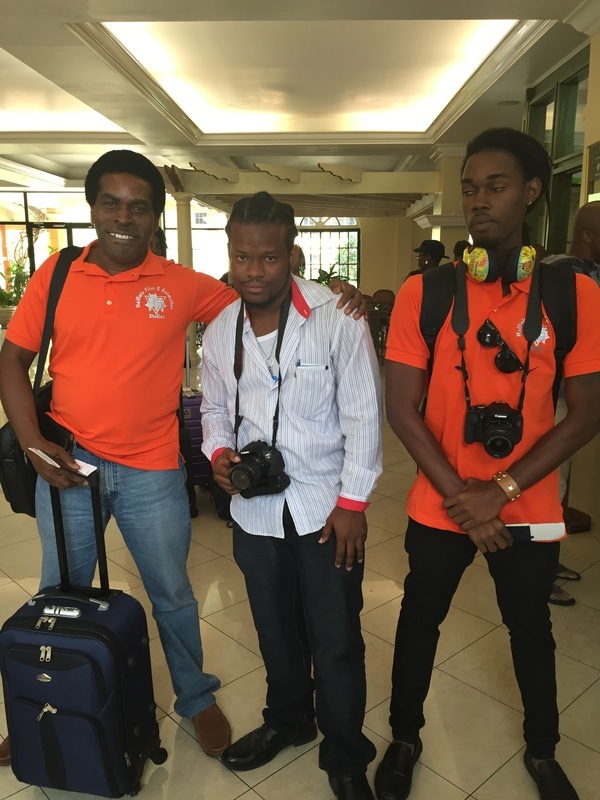 MFAS recently signed a joint venture agreement on the 14th June 2014 with the creative and multi-talented Saint Lucian twins Kendal and Kirnan John to produce a new animated comedy series featuring a Caribbean super hero named “Super Irie”. Kirnan John is one half of the John twins. He currently resides in Germany where he works as a qualified graphic artist. He specializes in storyboards, book illustration, and animatics. Some of his clients include Digicel and Nickelodeon. He also does full animation such as the television commercial for “Bizz' up” aired on television in St. Lucia. Kirnan’s twin brother Kendal John is the other half the John twins. He has been involved in the local television industry for over 15 yrs. Although he worked most of his career at Helen Television System, he is now on his own operating under the business name Silhouette. His accomplishments include a BET award nominated music video, a regional award winning 5 minute documentary and a half-hour documentary both on invasive alien species and a narrative short film entitled "The Numbers." Malfinis Film and Animation studio’s team of animators will be responsible for moving the Super Irie pilot from storyboard to finished animation . The series promises to be an entertaining and mischievous 12 minutess of pure Caribbean comedy. Look out for the release of the Pilot soon. “Tim Tim the river Crayfish” on it’s way to becoming Saint Lucia’s first locally produced animation adaptation of a children’s story book. Malfinis film and animation studio has teamed up with Mrs Fortuna Anthony, author/producer of the “Tim Tim” illustrated environmental storybook on the production of an exciting and engaging environmental animation video named “Tim Tim, the river crayfish”. This project is an expansion of an already successful publication of a colourful and entertaining interactive children’s story book written by a Saint Lucian, Illustrated by another Saint Lucian and is now also being animated by a Saint Lucian animation studio(Malfinis Film and Animation Studio), owned and operated by talented Saint Lucians. The Tim Tim story is one that speaks to a common environmental problem of unplanned development, poor waste disposal and the negative impact dealt to the environment by these rather common practices. The story seeks to educate the youth on the issue of bad environmental practice, non- sustainable social behavior but does so in an entertaining and interactive manner. Following the successful publication of the Tim Tim storybook the overwhelmingly positive response from young person﻿s, teacher﻿s, parents and funding partners from that project, The Author was convinced that it was time to expand the reach of the Tim Tim phenomena to the new and exciting platform of Animation. And so the author has developed a collaborative relationship with Malfinis Film and Animation Studio to produce the Tim Tim the river crayfish animation video. The Author Ms Fortuna Anthony is Saint Lucian born and an experienced educator at the school and administrative level with her experience not just limited to her country, Fortuna is deeply committed to family and children. She believes that the protection and conservation of the environment and all cultural matters must be taught at an early age if the people of the country must advocate and develop a deep pride in what is culturally their patrimony. Malfinis is currently working with Mrs Anthony to source the funding for producing this exciting bit of animation. The Choiseul Youth and Sports Council was awarded $USD10,000 by the Caribbean Development Bank, after having been presented with the opportunity to enter a proposal for a Road Safety project at the CDB Youth Vybzing forum, 2013. The project encompasses two phases; one phase involves the erection of guardrails and placement of signs in Toumac and Sabwisha. Mr. Oliver Sampson, retired engineer, serves as supervisor of this component of the project. The second phase is dedicated to sensitizing the public, especially the youth of Choiseul, on the issues of road safety, and the necessity to consider one’s life and the life of others when using our roads. The message on road safety is delivered by Mr. Martin Joseph of OMEGA Driving. Participants of this campaign include students and the motoring public, with special attention on minibus operators. Additionally, three animations have been produced by Malfinis Film and Animation Studio and will be aired on national television. The Council has accomplished a tremendous amount of work under the supervision of the Ministry of Infrastructure, Port Services and Transport. The Council is worked towards an April 30th 2014 completion date. Upon completion, two council members, Ms. Jeny Gaillard and Ms. Kina Nicholas presented the project report in Guyana at the CDB Youth Vybzing Forum on 22nd May, 2014. The Project Coordinator, Ms. Jeny Gaillard, continues to urge the youth to productively engage throughout the implementation process. The Council’s work is underlined by unremitting dedication to a vision of pride and togetherness among the youth. Accomplished videographer,artist and animator Guillaume Rico visited Malfinis studios on Friday 7 Feb 2014 to share some of his knowledge with the core Malfinis animators. Mr Rico met with Creative Director Milton Branford at a meeting held by the committee charged with the responsibility for forming the proposed Audio Visual and Film Association ( The first to be formed in Saint Lucia).Having checked out our website Mr Rico was impressed by our efforts so far and decided that Malfinis could benefit from his wealth of experience and skill if he was to offer some advice and direction to our young artists.We eagerly accepted his offer,after all Mr Rico has had a phenomenal career in producing over 2000 professional videos and TV ads of exceptional quality. The visit was a resounding success as the team hung on to every word from Mr Rico and although during this visit he focused primarily on how to improve on Titling as well as the basic composition techniques and preferences ,the team was extremely impressed with what he was able to impart to them in that short visit. We look forward to seeing Mr Rico again very soon. Way to go Guillaume, the team says thanks, don't keep us waiting too long for your next visit. 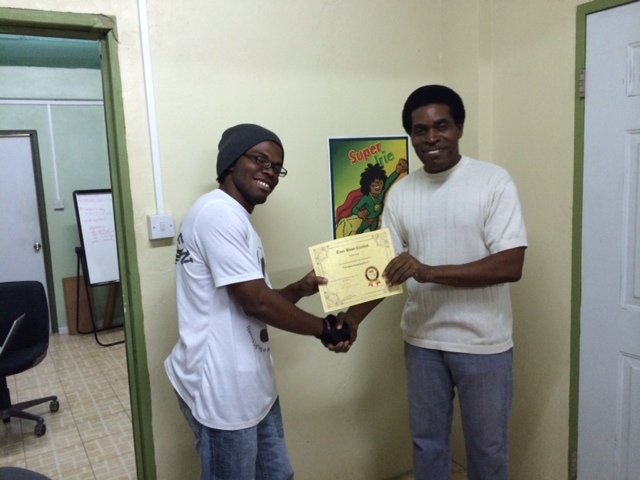 Malfinis welcomes new student animator Akeem Samuel. Akeem comes to us at age 22 and springs from a family where both parents Kennedy "Boots" Samuel and his wife Christine Samuel are well known both locally and internationally as pioneers in the Arts and Culture Community. Christine is an accomplished dancer , educator and craftswoman, "Boots" as he is more affectionately called by most, is himself an accomplished Actor, theatre practitioner,Cultural Activist , educator and historian,Creole language champion etc. Quote - "I joined Malfinis Productions in the hopes that I would get to spend my time with some other artists who share my interest, and to learn from them in the process. 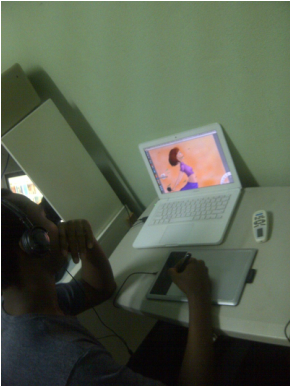 I also hope to gain the skills in animation and experience being in a working studio environment. Hopefully in the near future I can be a part of Malfinis Productions and their projects. My background was not too deep in the art or animation until more recently in my life. I Grew up loving animated series and animated movies not mattering what age they were meant for. I got into art during secondary school as a CXC course but didn't really get into it until half way through my time at the Sir Arthur lewis Community College. This was thanks to a friend of mine who actually introduced me to art as a career choice, animation being part of it. 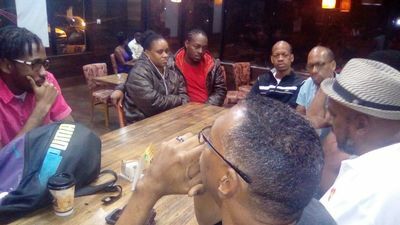 This was an interesting article published in the VOICE newspaper, it was written by my good friend and supporter of MTC and it's projects, Jacques Compton. Just thought that I should share this and say as well that we still miss Jacques, our most eloquent and learned Mentor. On the evening of the 7th,April at the University of the West Indies Open Campus , Morne Fortune, I witnessed an event which for a long time I had hoped to see before I departed this life. 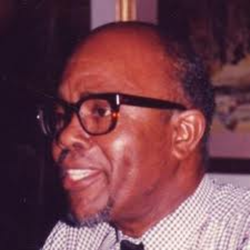 plays produced were directed by Roderick Walcott. Renaissance of Saint Lucian artistic creativity. 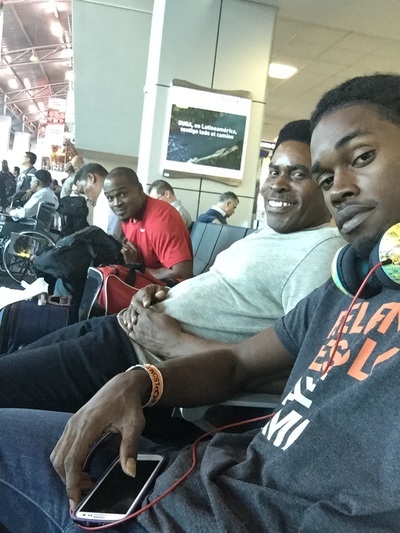 brother, Roderick, no one outside Saint Lucia knew very much about him. Walcott had carved a place in the modern theatre for the History of the West Indies. in 1904 at Monchy when a boy was killed so that parts of his body could be used for the purposes of black magic. the outside world to see and to experience the work of Roderick Walcott. photographs of famous landmarks and historical sights in Saint Lucia, photography by Mr. Frank Norville. Mr. Milton ‘Junior’ Branford had designed and built the set for the production of the two plays. I took the occasion of our stay in London to take some members of the cast on tours of my former home, London, introducing them to that great metropolis of thirty-two professional theatres, not to mention the numberless small fringe theatres. In attendance at the Roderick Walcott Ceremony was the Governor-General, Dame Pearlette Louisy, and the Hon Derek Walcott. gathered so many people who. in one way or the other, were and are still involved in the Arts. It was, indeed, a evening to remember and to reminisce, for the work of the late Roderick Walcott, that of his surviving twin brother, the Hon. Derek Walcott and the former Saint Lucia Arts Guild have been major contributions to the development, and appreciation of Saint Lucian culture and artistic creativity. Team Malfinis attends Ted Sandifords Animation workshop. When I was told that well known Saint Lucian Animation artist Ted Sandiford was going to have a few short animation workshops to share his knowledge and give some guidance to young aspiring artists, I thought that this was a great idea and a wonderful opportunity for the team of young animators in training here at Malfinis Film and Animation studios. 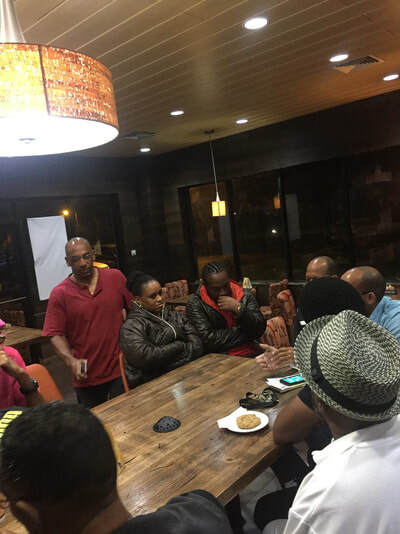 We discussed the idea of them attending, and all were in agreement that this would indeed be a beneficial opportunity to add value to thier training, and get some guidance from ( in my opinion) a very talented and creative artist. The team had a ball, and returned very excited and reaffirmed that they were on the right track with thier animation training here at Malfinis all along. just thought I would share some of the photos taken while at these workshops. ST. MICHAEL, Barbados (CDB) -- The top finishers in the Caribbean Development Bank’s (CDB) recently concluded 2013 VYBZING St. Lucia Animated Video Challenge will be attending the 2013 Jamaica KingstOON Festival scheduled for June 20 – 21, 2013, thanks to sponsorship from the Bank. 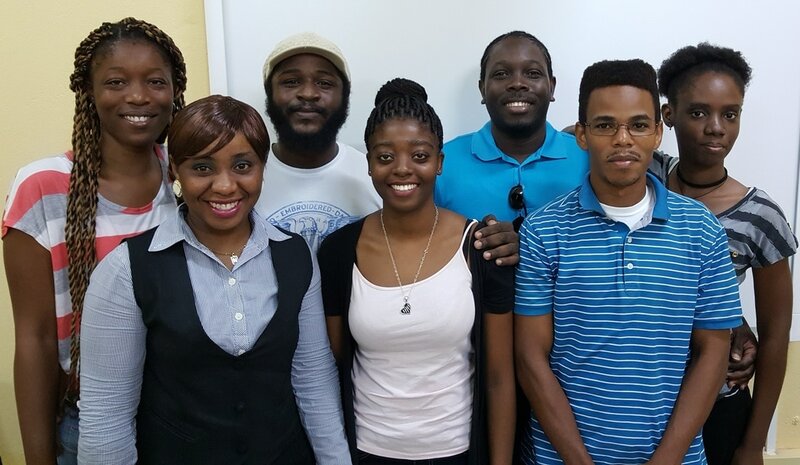 At the invitation of the World Bank, the first, second and third place winners; Marlan Edward, Darnell Lacan, Tevin Loctor and Dannal Casimar will be attending the two-day Animation Conference and Festival being held at the University of the west Indies’ Mona Campus’ Visitor’s Lodge, Kingston. Day one of the Festival features panel discussions and workshops focussing on ‘Developing a Career as an Animator’ and ‘The Art of Character Development.’ On Day two, topics such as ‘The Ins and Outs of Animation Production’ and ‘Storyboarding 101: Creative Technology’ will be discussed. There will also be a showcase of Jamaican and Caribbean talents working in the industry and related fields. The winners of the competition aspect of the Festival will also be announced on day two. Loctor said he too is looking forward to the workshops. “I hope to find inspiration and obtain knowledge so that I can improve my work and that of the other artists at Malfinis Film and Animation Studio, as well as help and liaise with others to improve our animating skills,” he revealed. VYBZING is the CDB’s platform for youth engagement with emphasis on youth empowerment and participation in the development process. The VYBZING Animated Video Challenge was open to youths in St. Lucia ages 16 -29, and invited submissions on the theme, “Road Safety: Save a Life, Save a Future.” The competition ran from March 8 to May 3, 2013. 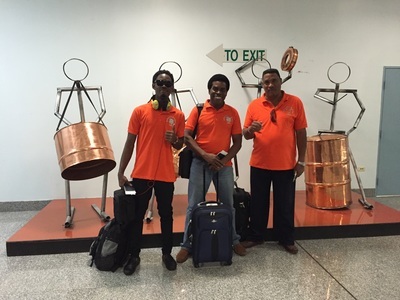 Managing Director Milton Branford wishes Dannal and Tevin "Bon Voyage" as they prepare to board a flight to Kingston Jamaica to attend the Kingstoon animation conference and film festival, complements of the Caribbean Development Bank (Hats off to CDB, in particular a very hard working and efficient Ms Angela Parris ) .